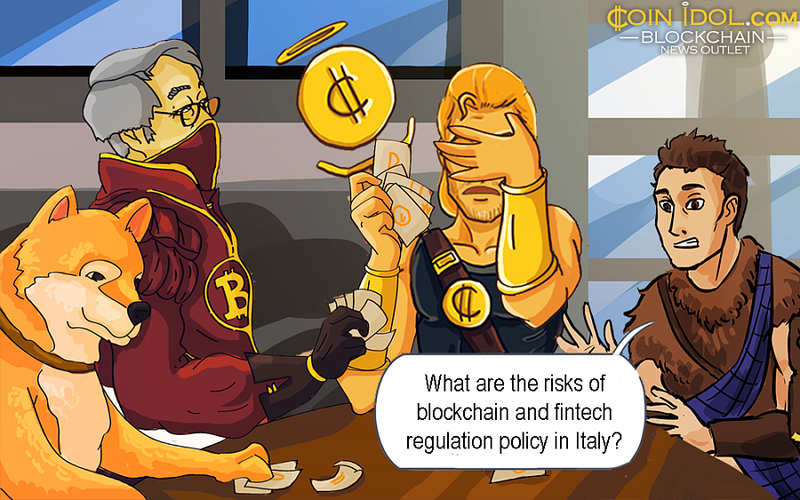 Home FINANCIAL Fintech What are the Risks of Blockchain and Fintech Regulation Policy in Italy? The intervention of the Italian regulator in the field of distributed ledger technology (DLT) was provoked by several reasons, including the extremely categorical definition of DLT and the need for amendments to smart contracts. The group of experts appointed by the government will develop a national strategy concerning the use of financial technologies in Italy. Simplification decree from the Chamber, which describes the use of distributed ledger technologies. The paper contains, among other things, strict definitions of DLT and smart contract. It is considered by many a very important attempt of giving the first answers to a line of questions about blockchain, its applications, and further development. However, the definition of distributed ledger technology provided in the brand-new document seems to be too categorical, as it would identify, for the purpose of recognizing the legal effects of electronic time validation referred to in Article 41 of EU Regulation no. 910/2014 (paragraph 3 of the same article). Without going into the merits of the validity of one or the other technologies or IT protocols, it is necessary to underline the opportunity to adopt a definition as liberal as possible. Technical standards should be used to identify technical requirements. Thus, for example, the State of Tennessee has recognized the technology of distributed registers defining it as “any distributed ledger protocol and its supporting infrastructure, including blockchain, which uses a distributed, decentralized, shared ledger environment and replicate it, public or private, authorized or without authorization and which may include the use of digital currencies or tokens as a means of electronic exchange “. As for smart contracts, the contractual clauses are transposed into computer code and are the result of agreements reached instantly or earlier. It is still a rather well-known contractual scheme, but to which the blockchain technology gives a new dimension since the possibility of executing the contract is guaranteed regardless of the will of the parties. The recent legislative proposal, in the first part of the amendment, provides a definition of smart contracts, which however could cause more problems than it solves. In fact, from the formulation of the regulation bill, it would seem possible to assume that “only” the execution of the “program” would oblige the parties to respect the obligations taken. In fact, we know that the execution of the contract is only a phase of the contractual relationship, generally following its conclusion, in which the services deduced in the agreement are executed by the parties. Therefore, there arises the doubt of the sensibility of introducing another sort of contract in the legal order alongside that of the code, rather than constructing a system of remedies as a response to the protection needs arising from new relationships. The second part of the article, the amendment, comes into force in the form of the smart contract, specifying that this type of contract meets the requirements of the written form set by the Agid. Also on this question, one wonders whether it might not have been appropriate to verify the suitability of the internal and supranational legislation governing the formation of the fintech document, trying to validate this “new” way of expressing consent and imputing effects. In this framework, the government has set its mind on the creation of an expert group on blockchain and artificial intelligence to create a national strategy for the use of these technologies, with the aim of preparing the regulatory and technical tools for their widespread adoption. Besides, the initiative of 23 European countries to give life to the European Blockchain Partnership, to which, recently, Italy has also joined, aims to foster collaboration among member states for the exchange of experience and expertise, both on a technical and regulatory level.